My, What a Guy, That Wes Faulk! So, we were at Walt Disney World. We had braved the Expo, we had ridden the buses, and we were all checked into the Corny Stars hotel. But we still hadn’t gone to the parks yet. Which meant that our first night? We wouldn’t be able to sleep because we were SO EXCITED! Even this was a good thing, though, as it made it super easy to wake up at the crack of dawn, which we did, catching a bus for the Magic Kingdom a handful of minutes later and arriving at the park a whole hour and a half before it opened. After exiting the Ariel ride, we strolled past Enchanted Tales with Belle, just to see if it was now open. It was, and the line snaked all the way through New Fantasyland and old Fantasyland and even back to the castle. Good grief! We called it a loss, went on to grab Fast Passes for Peter Pan, and then walked on to Small World. As would be the norm on almost every ride we went on for the entire day, we were put in the very back of the boat by ourselves. Wes said this was Disney’s way of encouraging us to make out every time a ride got stuck and/or experienced some temporary malfunction. I was all for testing that theory out when we got stuck in a room all by ourselves on Winnie the Pooh about thirty minutes later, but before we could even get one good smooch started, the ride cranked back up. So, there you have it — if the ride gets stuck, start trying to smooch your man, and the Disney powers that be will get the ride working again in no time. From Winnie the Pooh, we went to Philharmagic, the most underrated attraction in Fantasyland. We love that show so much! By the time the show ended, we were on time for our Peter Pan Fast Passes, so we rode that before heading on into Liberty Square and riding Haunted Mansion. This was our first chance to see and experience the interactive queue, and Wes managed to get soaked with water in the process. We’ll know next time not to push that button! This would be Wes’s only chance to get soaked that day, unfortunately, because Splash Mountain was closed for refurbishment. And when I say it was closed, I mean the water was drained and there was scaffolding up and covering the big drop at the end. This would be no quick fix, obviously. We Fast Passed Big Thunder Mountain then headed over to have lunch at the Pecos Bill restaurant. This was the first time we’ve ever eaten there, and it wasn’t too bad. Unfortunately, we picked a table outside, right where a group of birds were congregating. Given Wes’s fear of all fowl and the way people and birds alike just love them some Wes Faulk, this made for the quickest lunch we enjoyed on Disney property. More time for rides that way, though! We still had some time until we could ride Big Thunder Mountain with our Fast Passes, so we went to go and watch the Country Bear Jamboree. I’m not sure when it happened, but they’ve done some improvements to the show since we last saw it… two years ago? I’m not even sure it’s been that long, to be honest, but while the show hasn’t change, the bears seemed to move more and were much more fluid in their movements than they have been. Or maybe I’m just overthinking it. Which, you know, is hard to do given the cerebral nature of a show that revolves around stuffed bears jamming out to country music. Afterwards, we headed back to Big Thunder Mountain, only to be told that it was temporarily closed because of technical difficulties. We headed on to Adventureland where we picked up Fast Passes for the Jungle Cruise, then rode Pirates, watched the Tiki Room, and then rode the Jungle Cruise. We trudged back up to Frontierland, where we were able to get on a newly reopened Big Thunder Mountain. We even passed the mechanics coming down the queue as we were going up, which should have made me feel safer… but actually made me more concerned for my safety. (This wouldn’t be the only time this would happen on Big Thunder Mountain on this trip.) The ride was awesome, though, and we survived! At this point, we were way ahead of schedule. Not having strollers and small children who constantly need potty breaks really made for an easy, fast paced day… but it was not nearly as magical, unfortunately, as we learned after taking the train to Storybook Circus so that we could ride Dumbo. Yes, we rode Dumbo even though we had no children with us. I won’t be doing that again anytime soon, since being the smallest person in the Dumbo meant I had to sit on the inside and spent the whole ride practically in Wes’s lap. Not that he was complaining, but seriously? I could only stay in my seat if I held onto the side of the Dumbo. Roughest ride in the Magic Kingdom! We finished up the day’s rides on Goofy’s Barnstormer, which was a twenty minute wait for ninety seconds of… well, not much. I’m sure it will thrill Ana and Emma, though, so we’ll definitely go on it with them next time. We chatted with another lady there for the marathon while we were in line, and because Wes is Wes, she felt free to share her life story with us. (Why does this happen everywhere we go?) When she found out that Wes and I run together and that he slows his pace to stay with me until the finish line (say it with me — “awwwww”), she said, and I quote, “Oh, I wish I could meet a guy like you! I’d give anything to have someone to run with me like that!” The friend standing by her agreed with so much exuberance that I felt inclined to pull Wes a little closer and growl at them. (Not really.) They were even still talking about him after the ride was done. Seriously. 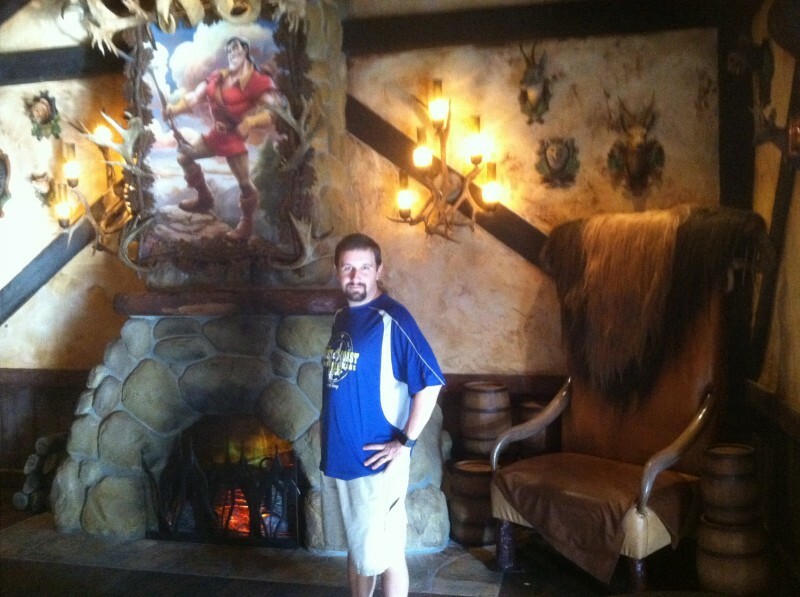 It’s like I was wandering around Walt Disney World with a modern day version of Gaston… except, you know, without him freaking out and trying to kill the prince in the end. Sing it with me — my, what a guy, that Wes Faulk!